Like many people, you may first think of estate planning as simply the writing of a will. However, it encompasses much more. 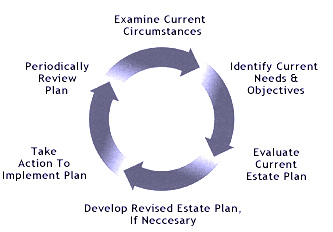 As you will see, estate planning may involve financial, tax, medical and business planning. A will is simply one part of that planning process. Other documents are needed to fully address your estate planning needs. There are several ways to plan. You could follow the government's plan (i.e. do nothing), create a simple will, add beneficiary designations to your accounts, or create a living trust. Everyone's individual situation is unique and requires a thorough analysis of your life circumstances. Why begin estate planning today? Preserving the assets you've spent a lifetime building. Protecting your spouse, children or other heirs. Ensuring your assets are distributed how and when you want them to be. Reducing the amount of estate taxes that will be due. Providing for a favorite charity. Our firm fosters excellence in comprehensive estate planning by coordination with our various strategic alliances to create flexible planning strategies and implementation. We offer personal and unparalleled service designed to meet the ever-changing goals of our clients throughout their lives.